Joining a jam session can be intimidating. 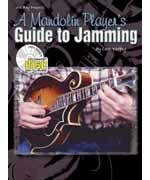 Presented here is everything a beginning or intermediate mandolin player needs to know to participate in a jam session. There are sections that describe how jam sessions work, and jam session etiquette. The book also describes the typical chords and keys for jamming, and describes right hand usage. A section is included on the role each instrument plays in bluegrass rhythm. A play-along CD is included with 9 typical bluegrass jam tunes. The tunes are played twice: once with the tune played on the left channel and a verbal description on the right channel, and once in stereo.